Tortilla Soup was a Mexican remake of the Taiwanese (I believe) film Eat Drink, Man Woman. What was interesting to me was that aside from some changes in cultural references, it was almost a line-for-line remake. That’s not what I’m talking about here, however. I’m talking about Terry’s tortilla soup. 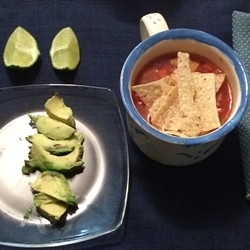 She has made tortilla soup before, but not this particular recipe. The recipe called for rotisserie chicken, breast and thigh. I had made chicken on our stovetop grill a couple of nights before, and I had extra, we she used that. It specified a poblano chili, but the store didn’t have that so I bought another variety. The recipe included onion, which she omitted as Terry is allergic to onion. She did, however, throw in some frozen corn. The result was a really tasty winter’s evening meal.